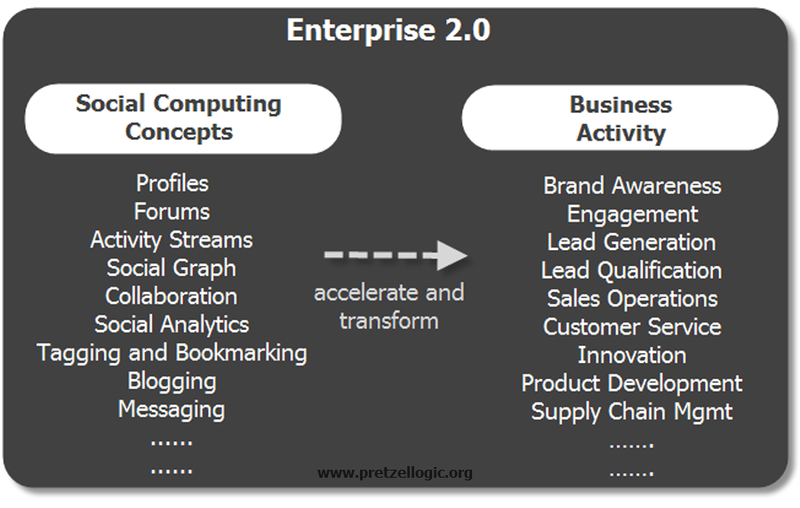 “Don’t confuse Enterprise 2.0 with social computing concepts”. Ignoring the dated terminology for a second, my premise was that social in the enterprise doesn’t mean throwing all sorts of features at the end user in an attempt to get them to emulate some combination of Twitter, Facebook and Wikipedia for the enterprise. Rather, its the decisive use of social and collaborative concepts to get work done. If there is one single take away from Dreamforce, its that enterprises are systemically closer to this reality than ever before. Not that we needed the declaration of the social enterprise for this to kick off or that Salesforce.com is the only option. We’ve been seeing users of social platforms find their own ways to self organize and improve business activity, but in many cases, in a silo’d fashion and one devoid of context: join a community on your social platform to have un structured conversations on a business activity. Then head over to your CEM/CRM/ERP/Call Center/system to make updates. Sounds fine in theory but the reality is the system of record remained your primary residence and the new collaboration system, your second home that you visit when you have time. Salesforce.com is now also playing a pivotal role in leading the cut over to contextual collaboration. Dreamforce conveyed that Salesforce.com has been immersed in twelve months of integration and investment rationalization. Only a few of the product related announcements really blew me away but that’s fine. Putting your investments and technology advancements to work is arguably as important as filling the top of the idea funnel. Even with respect to Chatter, the new functional additions were par for the course stuff. IM and presence, customer and product networks are really not that new and are available in the market. And like every other collaboration software, Chatter has its fair share of ‘can do better’s”. The three-part story on customer, employee and product networks is no doubt a step forward towards illustrating tangible use. But for those of us in the trenches with clients trying to make this work (and I strongly suspect Salesforce.com knows this as Marc Benioff alluded to it in the Q&A session), it takes a lot more of cultural, political and change management will to make this a reality. 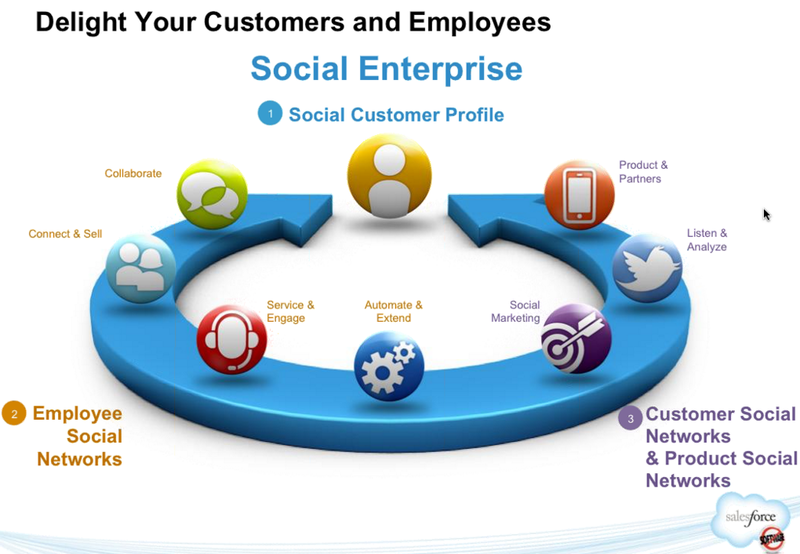 A social service layer now powers process centric collaboration for critical business processes in the enterprise. The Enterprise partner announcements include cloud based leaders who have their sights on the large enterprise market. Most of the ISVs offer a forklift solution and can make a go at it, alone. In other words they don’t ‘need’ Salesforce.com to build a successful business. So its a balanced partnership where both sides have as much to gain. If you’ve ever run biz dev, you know that’s generally the most healthy and practical way to truly get results from any tie-up. HR: Workday will integrate core HR processes such as approval requests, payroll, budgeting and spend with Chatter. See Larry Dignan’s post on this. I’ll post separately about Workdays Technology Summit. Quote and Proposal, and Marketing Automation: Infor, the third largest ERP vendor after SAP and Oracle will offer a 360-degree view of key processes and data such as invoice, contacts, quotes, shipments, receivables, orders, and RMAs across the enterprise. Chatter will turn these into social objects to foster collaboration. Travel and Expense Management: Concur Technologies will pipe both Concur and TripIt data into Chatter for both updates and collaboration/coordination between teams on the same trip. Brian Jackson at PC Advisor has the details. Supply Chain: Kenandy, the new startup shepherd by Sandra Kurtzig and backed by Ray Lane, will build a collaborative supply chain on the force.com platform and use Chatter to inject collaboration. I’m really big on this topic. Dean Takahashi at Venture Beat had more and Frank Scavo shares seasoned insight, here. Finally, Marc Benioff touched on two announcements that have really big implications on gaining traction. First, the Data Residency Option (DRO) connects the cloud to data centers behind the fire wall. Second, Chatter not only integrates with SharePoint but also allows a feed to even live on MOSS. This hybrid connectivity makes the cloud far more palatable for a lot of companies who want to selectively leverage the cloud. Our work on the ground on blending process and collaboration absolutely confirms this need. The interesting thing is Salesforce.com calls all of this “Social Enterprise” which can sound just as evangelical and nebulous as a good chunk of enterprise 2.0 and social business fare. But beyond marketing air cover, this is a move towards offering get work done systems that can enhance the quality of repeatable process on one hand and on the other, rescue the wild west world of exception handing that plagues our daily work. Chatter now stands to offer one of the most compelling pathways to 21st century collaboration. Salesforce.com will have to live up to this gigantic endorsement it just received from the ISV community. As these partners work on client deployments, the level of required handholding on getting collaboration right will be significant. As important, there is zero room for error with Chatter’s usability, its ability to scale collaboration (very different from registered users), its functional offering, security, and its filtering capabilities. Failing this, these self sufficient ISVs can easily jump ship (this is the cloud, after all). For me, the most critical missing element in the Chatter discussion was that Chatter usage was largely uni directional. In other words, pipe data and events into the stream. Chatter needs to showcase the writing back to systems of record to close the activity loop if it wants to truly become the workbench. And from a managerial stand point, social analytics need to flow back to BI systems as well. Whilst the keynote stage showed forward thinking executives from Burberry and BMC talking about the social enterprise, there are as many CEOs who will find the social enterprise message a tad bit racy. To his credit, Marc Benioff did recognize in later meetings that this can’t be overlooked. The Sales teams will have to make this translation from hope to the needed elbow grease, effectively. Last year’s message was of the inspirational kind. This year could have been more of the perspiration variety that illustrates operational and financial results from successfully embracing collaborative ways of work. I wished we had some hard hitting facts on the keynote stage that showed hard results: more wining products in the market, lower support costs, agility, etc.). I was really glad to see Radian6 and Jigsaw data inside CRM. Speaking with folks such as Tristan Bishop from Symantec and Chris James from GNC, it was clear that R6 is being used to solve big call center and product development challenges. But the Radian6 magic could have been far more central to responding to the larger challenge of unified customer touch point integration. 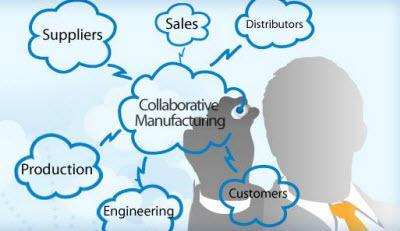 Salesforce.com is certainly not the only one to bring process collaboration to organizations. Jive Software has proven to be a juggernaut in the space and its Appstore offers an ecosystem as well. Yammer has a deal with NetSuite and integrates with Salesforce.com. Newcomer Tibbr from TIBCO offers by-directional interaction between activity streams and ERP Systems that is really promising. And many more, including Oracle who is working on socializing BPM and CMS content. The customer still has choice. All up – if you’ve read this blog before, you know why this is closer to my strand of collaboration. The giant discuss button that should have always been sandwiched between the submit and cancel buttons in enterprise systems is finally looking like its going to go mainstream. That will have a profound impact on our ability to source the best insight at every stage of a process or activity. And if done right, will significantly improve the accuracy of what we eventually input into our systems of record. Better data quality for those managers relying on inputs and better analytics for those trying to make sense of data to steer the business. @dahowlett: Anyone who writes off ANY business app in the cloud as ‘not happening’ is plain <expletive> mad. All your systems of record apps can in principle live in the cloud, if it makes sense for your business. The pipes are being laid to enable process and decisive collaboration in cloud based systems from the get go. So if employees are getting trained on Infor or Workday when their CIO makes the switch, collaboration know-how on how to improve business activity will be an integrated part of this cut over. With native BRO and SharePoint connectors and a significant investment in systems integrator Appirio, a hybrid connectivity world is most certainly needed and available to hand hold those not fully converted. And finally, that competitive advantage will not come from customizing commodity business processes apps or from, in my mind, questionable claims of better economics from cloud based solutions. Rather, it will come from superior user experiences, a balance between structured and collaborative work, device ubiquity, and significantly better speed of business execution that cloud based systems are extremely well positioned to accommodate. Comments rolling in on Google Plus as well, here. This might probably be one of the most detailed and thorough articles that I have come across over the net. The concept of using social computing and collaboration are interesting ; but isn’t Enterprise 2.0 , social collaboration and SOCIAL MEDIA MARKETING one and the same concept. Social Marketing is a collaboration between the various dots that make up the social sphere over the internet.